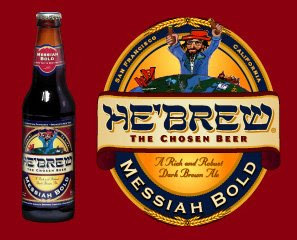 True to their word, the brewers of HE'BREW "The Chosen Beer" did create a "rich and robust dark brown ale" named "Messiah Bold". After Sir Bowie discovered the Pomegranate beer made by the same brewery online, I went on a "Quest" to find this interesting beer. I discovered that the Winetree Liquor Store offered HE'BREW, but only carried the Messiah Bold. Yesterday, during our celebrations around the pool, I shared the Messiah with several of my Catholic beer guzzling brethren. The verdict, the Messiah is indeed bold, in brew and in spiritual matters. We may disagree if the Messiah is coming or already been here, but we can agree that the chosen brew of the day was Messiah Bold! We have been contacted by the brewery in thanking us for a shout out and extending a hand in finding their fine product. I informed them that one of our esteemed members lives in England, where unfortunately, the Messiah has apparently not appeared yet, at least in drink. Seeing that I do not possess the spiritual powers to change water into beer, without the assistance of brewing technology, Sir Dayvd will have to wait to wrap his lips around a bottle of Messiah Bold. I was informed by the brewery that they were working on a strategy to get across the pond. I suggest a "HE'BREW INVASION"! It worked for music! McEwans Champion Ale. It is 7.3% and i'd drink it like water if the shops sold enough of it down here in the south of the island. It is unbelieveably scrummy and drinkable. You boys are a bad influence.